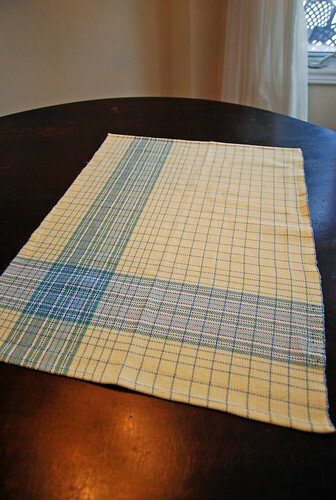 First stack of kitchen towels! Weaving is here to stay, friends. The 3+ months as a student with MargaretJane Wallace & Joyce Newman have been wonderful. The awe is a little less immediate a few weeks into having made useful somethings – now I can write about the process. It’s time, and then I will pack Mom’s towel up with another special project, and mail all to Jamaica. Why yes, I do own a sewing machine. 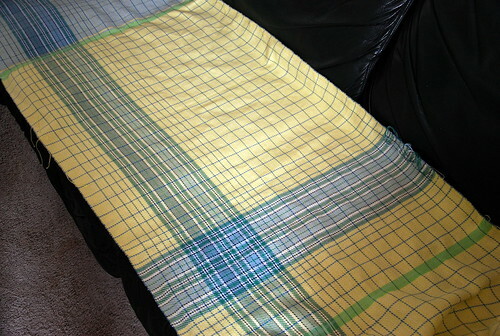 It came down from the closet shelf for the occasion of sewing 3 lines of stitches to secure the cloth for later cutting. I would not call any of these lines straight but no needles were broken that cold January day! 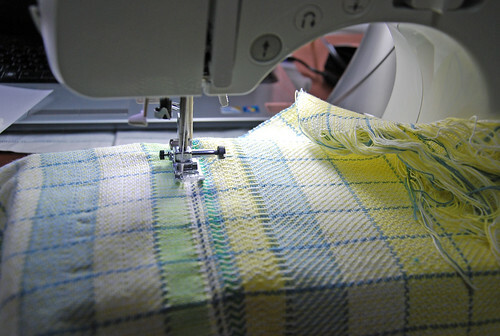 The first weft was protected by my machine stitching here. It’s the edge with my sampling for the towels. Peggy Osterkamp says in Weaving for Beginners that the cloth at this stage is called “greige” or “gray goods” or in the loom state (p. 137) as it is still unwashed. Even at this stage, I could tell that Mom’s towel would come out well. The sewing-in of the ends process took a good long while but it wasn’t too tedious. As instructed by MargaretJane, it was fine for the washing machine (cold water) & dryer. Little did I imagine that hemming would be its own learning process but it was! Mine are hand-hemmed with a slipstitch. 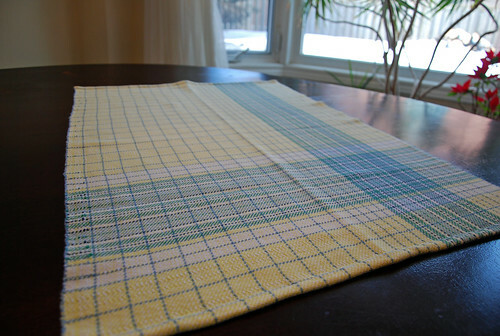 When hemming went correctly as it did for Mom’s towel the plaid is on the left. Same day, same person sewing. 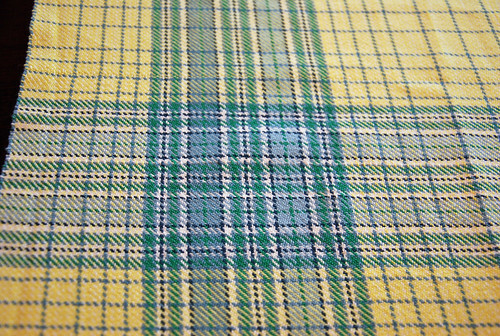 All I can say is thank goodness for the balanced twill – it really does not matter which side the hems swung. Except to yours truly who will always know. My twill lines (45° angle) show the merit in practice making perfect. I used my protractor in the first towel, and it helped me pay attention to my beat as I wove. 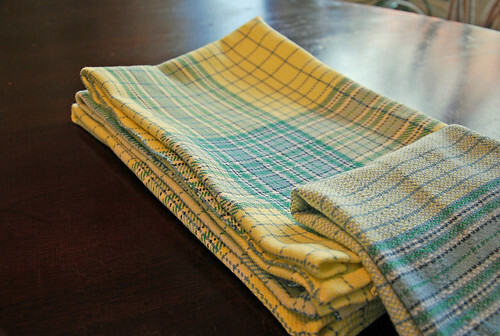 The last towel is a shorter 19½” x 15″, and is woven in broken twill. It has the most mistakes because I was so anxious to finish weaving. I really like the left-side stripe. There is no plaid in this towel but I like it lots. Hemming the second towel showed me the weave is slightly looser at the bottom edge. 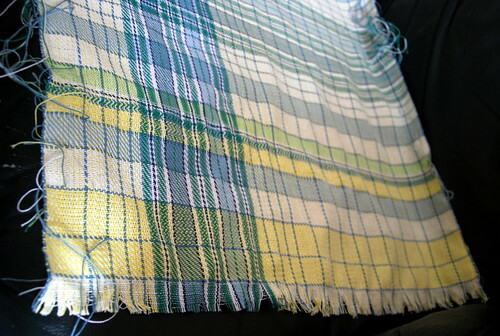 When folded in half you see the exact spot where I adjusted my weaving beat – the selvedges are not even end-to-end. It’s great to see the mindfulness in the cloth. After using the protractor, I kept an even beat for the rest of the warp. There are also some treadled mistakes in the twill sequence. What does not show is the early struggle to even throw each shuttle 22″ across the race. My class warp is for a gamp – 4 new twill threadings are now done and all 5 are almost sleyed. 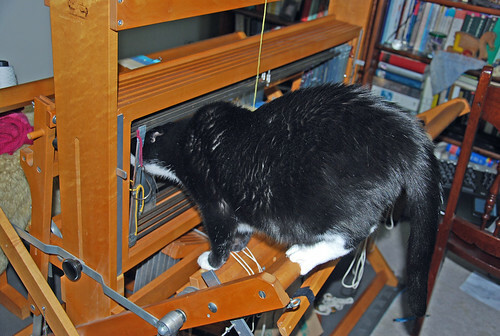 The warp that Tuesday Melvin was admiring is a small sampler. 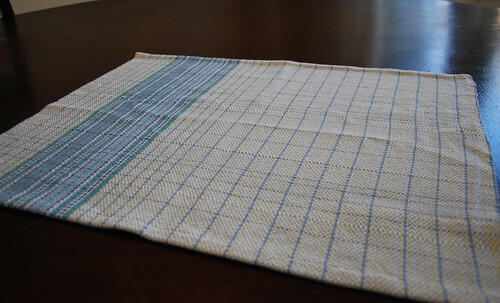 Categories: Finished & in the wide world, Getting the knack, Weaving | Tags: 8/2 cotton, Floor Loom, handweaving, kitchen towels | Permalink. Thanks, Naomi! Melvin waves back at Mel (he is very into what I am doing today)!